This lightweight single-plug headset is designed to be universally compatible with all iOS and Android-based smart phones and tablets. Perfect for podcasting, mobile and distance learning, as well as language learning applications, computer labs, gaming and presentation software. Flexible boom mic can be folded up and out of the way when only listening, and the adjustable headband fits a wide range of students. Recessed wiring is completely tamper-proof, and the permanently attached 3' straight cord has a reinforced connection that resists accidental pull out, perfect for the rigors of daily classroom use. 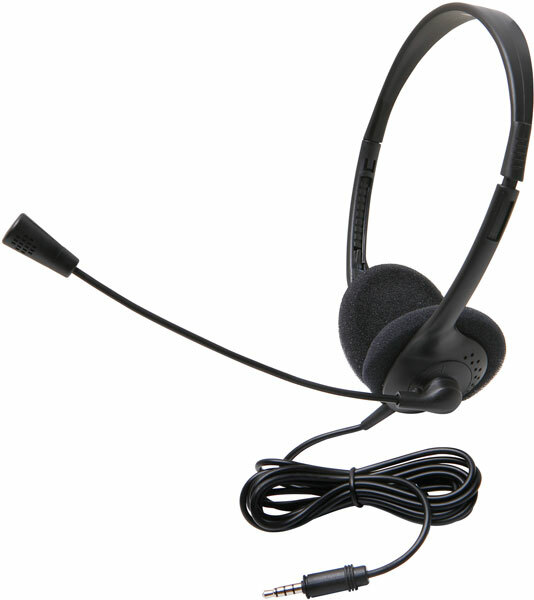 With tablets and smartphones becoming increasingly popular in the classroom, this headset is the prefect choice! Device Compatibility: iPad®, iPhone®, iPod®, iOS®, Android®, Kindle®, Kindle Fire®, Galaxy, Kuno, Kineo, and more!